Hello and welcome to my blog where I share meditations from my journal. I love God and like to write about Him and His Word. I was reconciled to God through His Son Jesus Christ many years ago. Although I’ve made many poor choices in life, God has been faithful to me through the years. Now I want to walk closer to Him each day. I hope my “Journal Jots” will help people to come to Jesus, to receive His salvation, and/or to be encouraged in their walk with Him. The devotions I share belong to me, and I’d be glad for you to use them or share them with others as long as they aren’t used for financial gain and if proper credit is given. If what’s written blesses you, I credit God’s gifting. If not, I acknowledge my imperfection. Your posts are always a blessing. Thanks for following my blog as well. Thank you for your like of my post, “The Day Before Palm Sunday.” You are very kind. May our Lord Jesus richly bless you. You’re welcome. It was very good. And may Jesus richly bless you. Thanks for your comment. Actually I do share my own thoughts often. If I’m sharing a blog post from someone else, I try to include in the post title “Link to…” I probably don’t write my posts as often as I should, but I’ve had a little trouble making time for both reading and writing. I’m sure God will help me find the balance He wants for me so I can fit more into His plans and purposes. P.S Oops! I looked back at the last post I wrote sharing my thoughts and see it was April 17! You’re right. It’s been a while since I shared my own heart instead of what someone else said. As I said, I’ve been having trouble balancing reading and writing time. Thanks for reminding me to make time for writing. Thanks Scott. And may God bless you also. Thank you for sharing Tricia, so beautiful, God’s Love and Mercy are eternal and His Redeemed Children are very close to His heart. Thank you Tricia for joining up with me on Kingdoms Garden, I don’t visit there often but hope to do so more in the future. I’m looking forward to your sharing more of your Journal Jots, I hope you don’t mind me asking Tricia but how and when did you decide to follow our King of Kings. I don’t mind your asking, but I don’t remember for sure how I came upon your blog–probably a link from another blogger I follow. I think the first one I read was about creation-evolution and the God-idea that helped you teach youngsters the truth of God’s creation. It was very good and a topic of great interest to me. My blog-following stats say that I started following on July 29. Wow Tricia I sure confused you, I should have said our Lord and Saviour or Jesus Christ, I refer to Him at times as our King of Kings because He is called by that name is Scripture ( see below ) I was asking how did you first learn about Jesus and when did you commit to Him, sorry I will need to be carful or others may think I’m referring to my Blog too. Revelation 19: 16 And he hath on His vesture and on His thigh a name written, King Of Kings, And Lord Of Lords. Oh my! Now I understand. I think I was about 10 or 11 when I first asked Jesus to be my Savior. My older sister made her commitment to Jesus after church one Sunday morning, and my mom asked if I wanted to do that too, and I said yes. I was baptized the next week and really tried to live as a Christian after that. However, I didn’t know and didn’t find out until many years later that I was only partially committed to Him–I would go His way to a certain point and then try to make things work my way. In my late 20’s I experienced God’s love in a fresh way, and His Word came alive for me, and I’ve loved the Scriptures ever since. I think I was in my 40’s when I had a major experience of repentance where I saw that I wasn’t completely committed to the Lord. Then I told Jesus, “Okay, from now on, as much as I know, I will say ‘Not my will, but Yours be done. '” I believe God had His hand on me all those years from the time I first made that partial commitment, and He draws me closer and closer to Himself. I still stumble though and have to ask His forgiveness often for self-focus and other failures. I’m 65 now, and trying to learn to listen to God and obey Him more quickly. Hi Tricia, I just want to thank you for the Blessing that your Blogging friendship has been to me and I look forward to sharing with you more in the future, thank you for your flowers of Love. Hi Tricia, thank you for acccepting The King of Kings Friendship Award, we are blessed that you did. Oh I wish we could share tea in person also! Who knows, though, maybe at the King of Kings’ banquet, there will be tea as well as wine for us all to share with Jesus. (Grin) At any rate, I know I’ll meet you there if not before. You’re right. And heaven will be wonderful because we’ll be with our Lord Jesus forever and ever. And I loved the “God speaks–I listen” post about Jesus returning soon. I hope our blogs help more and more people to be ready. Thank you for this wonderful comment. You’re such a blessing! I’m glad we found each other in the blogosphere. Thank you also for the blessing of the King of Kings Friendship Award. I’ll look up that link immediately. I also have been having some problems with W.P. notifications not being made. I’m hoping it’s a temporary thing. 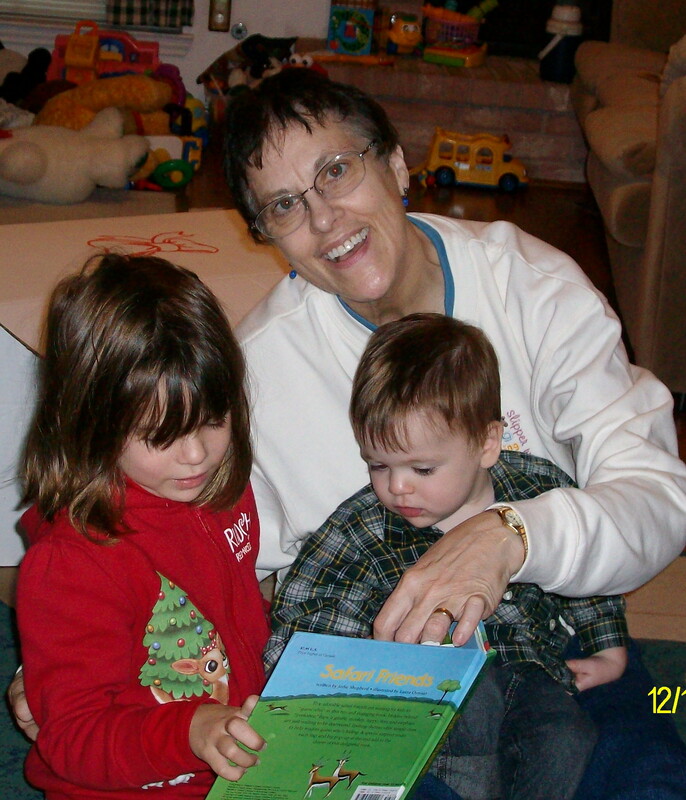 Hi Tricia how blessed you are to have your Grandchildren and how blessed they are to have you for Love and direction. Thank you again for your support on our Blog, sorry but we are having problems with W.P notifications, such as those who join up with us, our comments on peoples previous Posts, you may have to check back and also replys to comments on our Blog, if not received in your In box please check our Blog for them, I may if needed e-mail you in case you don’t receive this comment. We would also like to offer you Tricia, The King of Kings Friendship Award, it’s very differant from most, more like a blessing and some call it that or a gift as there are no rules, you can accept it as you feel in your heart or not, it is to afirm we are one, we are family. I really appreciate Awards they are a wonderful encouragment, I always seek to keep the rules but they do need to be given without pressure, which thankfully most are. I still have some to Post and hope to do a few next week but will do so when I feel lead, I really liked how you Posted yours in two parts I thought it was a good idea. Thank you again for sharing from your heart to ours. Hi Tricia and Thanks for Liking my blog! I always enjoy meeting new people in the blogosphere — now I’m off to poke around through your writings! Thank you Lori! You’re very kind. Thanks Dee. And thanks for all your prayers. Love the picture of you and your grandbabies. So glad you have your blog up and running. I’ve missed you Journal Jottings.